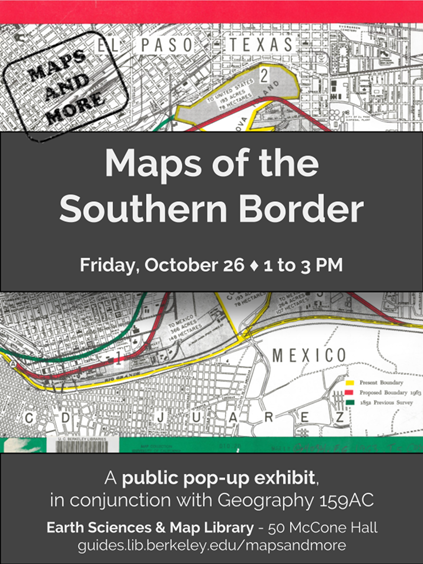 This exhibit highlights three air photo sets recently purchased by the UC Berkeley Library that cover San Francisco in the critical post-war years through 1958. Flown by Pacific Aerial Surveys, these large-scale images capture detailed snapshots of the rapidly developing city. We’ll be joined by special guest Dave Ruiz, Imagery Analyst & Data Archivist at Quantum Spatial’s Novato office, to learn about how these air photos were produced. 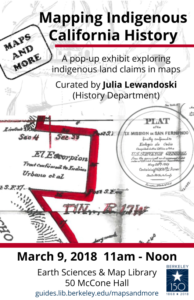 This event explores just one chapter in California’s complex and on-going indigenous history, by featuring maps of Native American land claims made in the 1850s. After the 1830s secularization of the Spanish Franciscan missions where many Native Californians were forced to live and labor, some Native peoples still living at former missions managed to obtain titles to land from Mexican authorities. After the U.S. conquest of California in 1848, these proprietors had to claim their land again, this time to U.S. officials. Alongside broader maps that show California’s rich indigenous past and present, these land claim maps tell a story of indigenous resilience in the aftermath of the mission system and in the face of U.S. conquest. 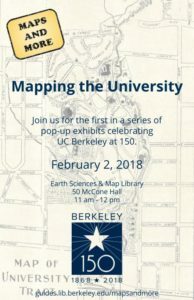 The first event of the term in the Maps and More series is “Mapping the University,” an exhibit of campus maps celebrating UC Berkeley at 150.